I’ve been working with a media firm to find archival materials for a documentary about the history of cancer. They are specifically looking for images within our Medical World News Collection. This project has been a great opportunity for me to familiarize myself with this amazing photograph collection and all it has to offer. It consists of photographic prints and negatives. When I say negatives, I can also say outtakes. For a typical article a photographer might shoot about 6 rolls of film with 36 frames. From those 216 shots, only 2-3 images might be used in the published article. Does this mean the other 213 images are rubbish? Not at all! An editor has to make some tough decisions with limited space on the page, and many great images are omitted by no fault of their own. 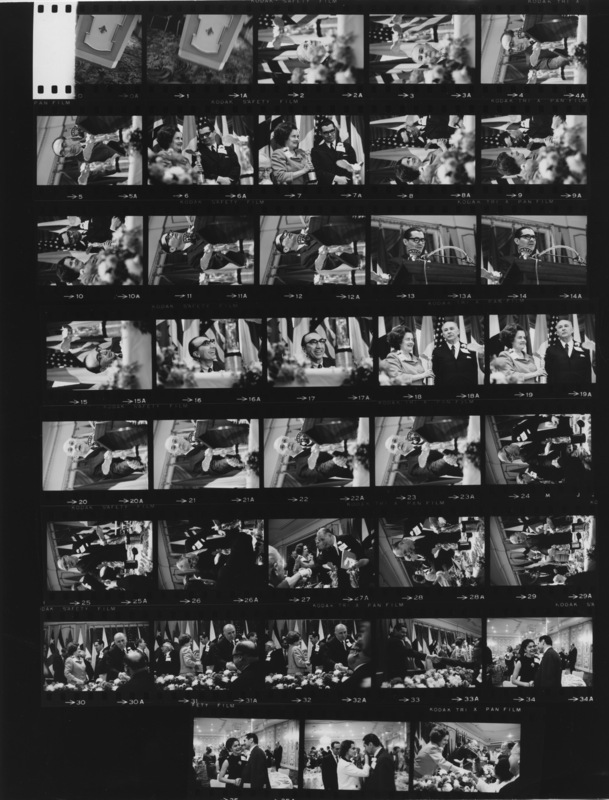 Below is a contact sheet of the 1966 Lasker Awards banquet. Contact sheets (also known as proofs) are a great research tool because they allow you to view an entire roll of film on one sheet. Within the publishing and photographic process, they are essential for assessing the quality (sharpness, exposure, lighting, and composition) of each image in order to decide which frames should or shouldn’t be enlarged. Imagine that you’re a magazine editor, which images would you publish? Contact Sheet from 1966 Lasker Awards. Individuals in the image include: Dr. Sidney Farber, Dr. Michael E. DeBakey, Mary Lasker, Dr. George E. Palade. Photographer, Mottke Weissman. 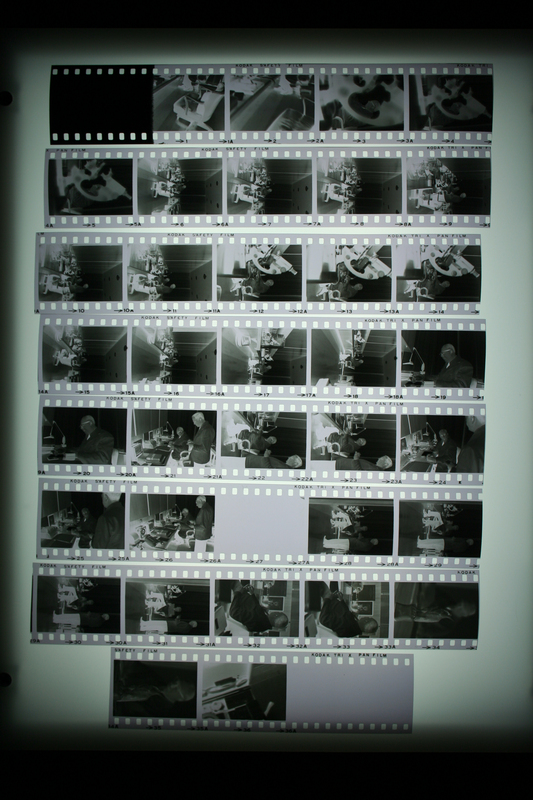 In contrast, here is a roll of negative film on a lightbox of Dr. Sidney Farber working in his Boston Office in 1966. The small 35mm frames are more difficult to assess their quality. Can you pick one frame that should be a 8″ x 10″ print? If you can, hold on! We have 15 more rolls of film from this photo shoot that you need to go through before you can make your final decision. Roll of 35mm film negative being viewed on a lightbox from the Dr. Sidney Farber feature in the November 25, 1966 issue of Medical World News. The photo shoot took place at Dr. Farber’s offices in Boston on October 18, 1966, photographer Joe Baker. Dr. Sidney Farber, who received the Albert Lasker Award for Clinical Research for his career-long work to control childhood leukemia. George E. Palade, who received the Lasker Award for Basic Medical Research for redefining the structure and functions of cells. Eunice Kennedy Shriver, who received the Lasker Award for Public Service in Health for championing legislation to improve care for the mentally retarded.